REMEMBER WHEN YOU THOUGHT YOU COULDN’T DO IT. WHEN YOU WERE TOO NERVOUS, TOO TIMID, TOO SCARED. THIS WAS NOT FOR YOU. YOU WANTED TO BACK OUT. BUT YOU DIDN’T. YOU TOOK A DEEP BREATH AND STEPPED FORWARD. BECAUSE IF YOU CAN DO THIS, YOU CAN DO ANYTHING.Take the 40m (131ft) leap off the iconic Auckland Harbour Bridge. The views of the city will take your breath away before the jump does. This is an unlimited freestyle site so anything goes plus you can go tandem to share the madness. You get exclusive access to the bridge with a 600m walk out over the ocean, plus this is the only ocean touch Bungy in NZ. SAFETY COMES FIRST – ALWAYS The Bungy originals, we’ve been doing this stuff for 30 years and our crew is the most experienced in the world. We were the first to be awarded an ‘S’ mark for exceptional safety, and safety is at the heart of everything we do. Our impeccable safety record puts your safety – and wellbeing – first. 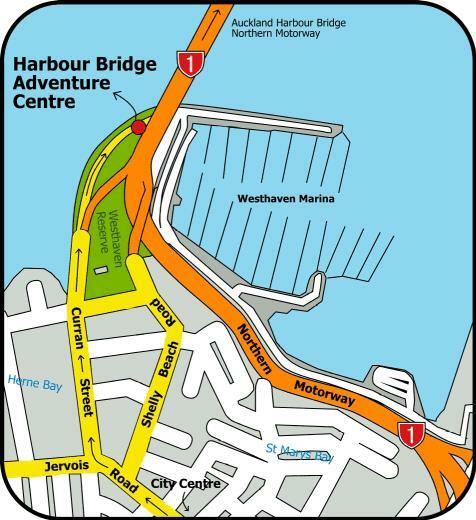 THE FACTS HEIGHT 40 METRES (131ft) ONLY AJ HACKETT BUNGY IN THE NORTH ISLAND JUMP WITH A FRIEND – TANDEM JUMPS POSSIBLE WATER TOUCH AVAILABLE EXCLUSIVE ACCESS TO HARBOUR BRIDGEAuckland is home to the worlds first Harbour bridge Bungy Jump and is operated by the Bungy originals. As part of the Bungy experience you'll enjoy an exclusive bridge walk out to the specially-constructed and sensationally-suspended retro "Bungy Pod". It's here you'll build up the courage to leap out over the Waitamata Harbour.The Ultimate Challenge is Bungy, go from nervous to completely elated in five seconds. Our customers tell us it's the best thing they have ever done. Once airborne take time to enjoy the views of the Harbour, that is if you can keep your eyes open long enough. There's a variety of Bungy options available with the optional 'water touch' being the favorite. You won't be able to capture the true spirit of Auckland without giving this Bungy a go.